David Crocker, Founder of the Inasmuch ministry, often says: “When we do what God tells us to do, He always has more in mind.” With the Willards, it was to serve up fried okra and/or pork loin and/or made-from-scratch cake or a variety of menus to the veterans at the VRQ every month for 10+ years. Sometimes, all we need to do is share a story. Thanks to our friend, Hal Melton, Associate Pastor of Missions and Senior Adults at Trinity Baptist Church in Raleigh, NC for sharing this wonderful testimony from Rev. Elizabeth Burgess and the project she led on their Inasmuch Day April 25 of this year. “Prior to departing for our Inasmuch Wake Med adventure, our group gathered to momentarily reflect on why we were going. More than a project, it was our hope that this morning would bring opportunities to share the love of God and the hope we have in Christ Jesus. Together we acknowledged that failure to bear and share fruit in the Christian life is to keep others from being blessed as God intended. Every minister that has been at it for a while has a toolbox of ministries—ideas, programs, “tricks of the trade” he has used in prior places of service. These are tried and true ideas he can implement in a new place of service which will enhance his church’s effectiveness as well as the congregation’s confidence in their pastor. New friends, John and Logan. The picture is of my new friend, Logan, who attended the North Carolina Region 8 NC OIAM 2016 training in Shelby, NC Saturday, January 9. 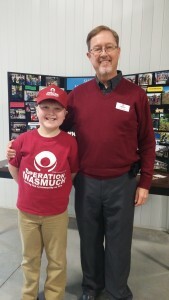 He is a great “poster-child” for Operation Inasmuch! But it is because of the example and leadership of his father that he and his brother are committed participants in the Compassion Revolution. 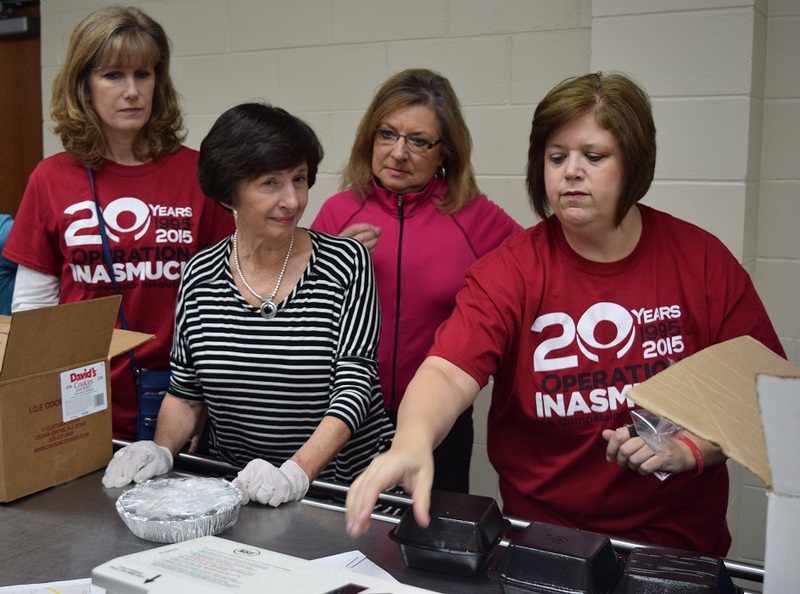 Virginia students serve in Inasmuch Day. that the Inasmuch model is useful in achieving that worthy goal. Last fall 46 members of the Baptist Collegiate Ministry at Longwood University in Farmville, Virginia, conducted an Inasmuch Day on their campus. They bused tables in the dining hall, picked up trash around campus and delivered homemade cookies to the campus police. In a creative way to serve, these Inasmuch volunteers gave away toilet paper to their fellow students and wrote notes of appreciation to the faculty. A second Inasmuch Day is planned for this spring at Longwood, this time with 2 other Christian organizations participating. Word of Inasmuch at Longwood spread to the Baptist Campus Ministry at Old Dominion University in eastern Virginia. The ODU group conducted their first Inasmuch Day on February 7 & 8. With only 25 students participating they conducted more than a dozen projects. Beta Upsilon Chi fraternity at the University of Tennessee conducted their first Inasmuch Day on November 2, 2013. A Christian fraternity, BYX is intentional about incorporating compassion ministry in their fraternity life. 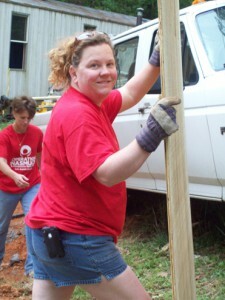 The group mobilized 8 teams of volunteers in November. They constructed a wheelchair ramp for disabled widow, painted transitional housing for FOCUS Prison Ministries, sorted donated items at the Salvation Army and Angelic Ministries in Knoxville. University of Tennessee BXY fraternity students sort and organize items for an agency during their Inasmuch event. In October the Inasmuch ministry assembled more than 11,000 meals to feed hungry people in Haiti with the help of people who gathered in Fayetteville, NC, and Knoxville, TN, to consider their support for the ministry for 2013. That’s right; these annual fundraising events became major service events! 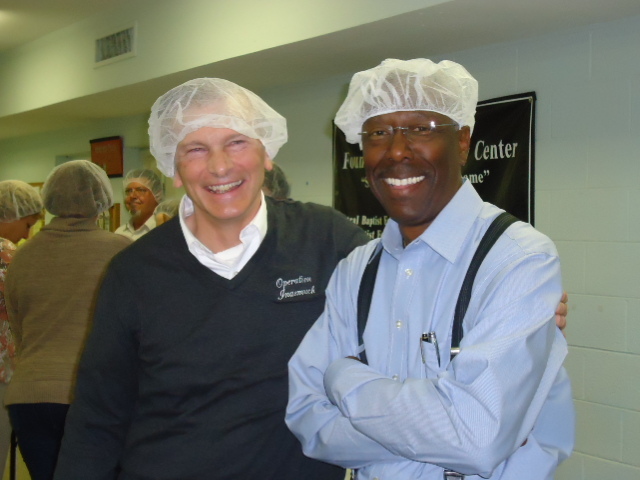 Executive Director, David Crocker (left), and Robert Marks, Sr. (right) Board President, enjoy watching the meals being packed. Fundraising is the lifeblood of non-profits. It is all about obtaining the support necessary to keep the organization going. So, when a non-profit turns its annual fundraising events into service projects whereby thousands of hungry people are supplied with nutritious meals, it’s noteworthy. Participants remarked how refreshing it was to do something to help others while renewing or beginning their support for a ministry that is based on the idea of believers serving “the least of these.” While some were treated to a delicious meal, others packed food for Haiti. After about half an hour, the groups rotated so that everyone had a chance to help out. 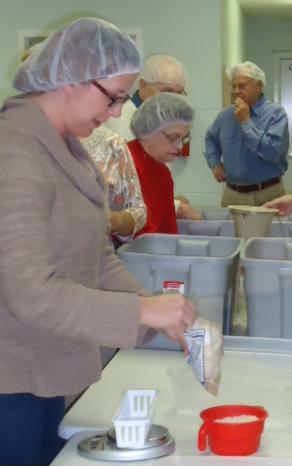 5,040 meals were packed in Fayetteville and 6,024 meals in Knoxville. And the fun continued in Knoxville! 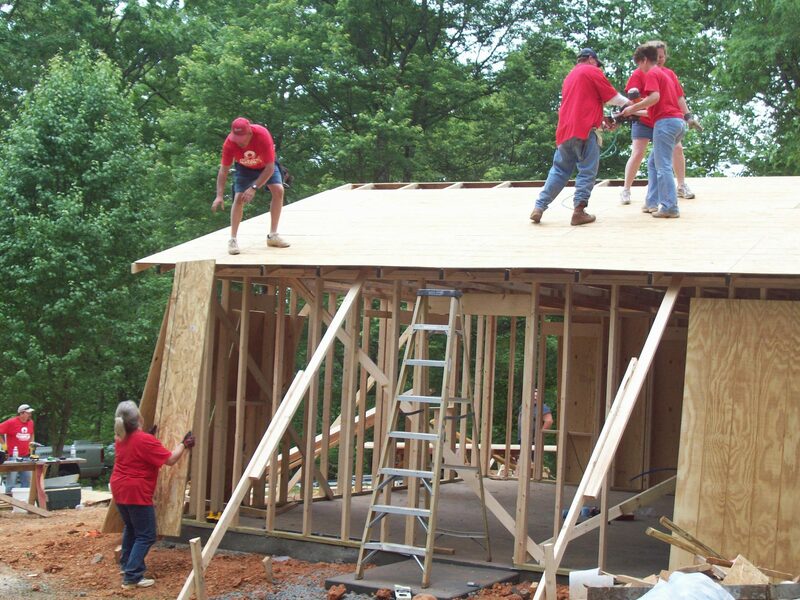 NC Inasmuch Builds House In One Day! 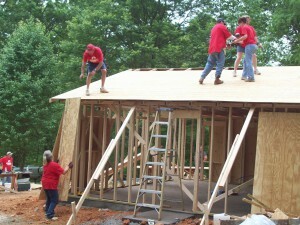 One of the 19 projects conducted by the Euto congregation was building a house in one day!! “The foundation was poured beforehand, but we completely dried-in the house—walls, roof, doors and windows—in one, long Inasmuch day,” says Guinn. He says that about a month before Euto’s Inasmuch, one of the church members asked if the church could build his grandfather a house. The elderly man in his mid 80s had recently lost his wife and he needed to live closer to his son but couldn’t afford to hire a contractor. The church agreed to include the ambitious project among their list of ministry opportunities and God took over from there. 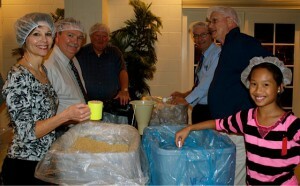 The man’s family purchased the materials and church volunteers provided the labor. Euto Baptist Church involved 155 people from their church in their Inasmuch Day which is just under half their congregation. 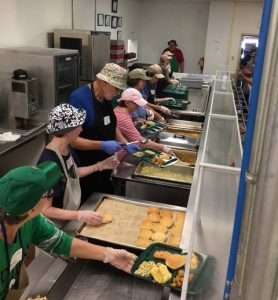 They served more than 200 people, and the most amazing result of their day of service was that nine people became followers of Jesus as a direct result of the compassion ministry they rendered through Inasmuch! Guinn’s unchurched neighbors were astounded at what the church did in one day. They attended a breakfast gathering of the volunteers prior to the start of their projects and were moved to ask: “Why are y’all doing this?” They returned to their home that day with nothing but praise for a church that has shown, not just told, their small community God’s love.